Originally I only wanted to publish these two photos side by side as two terminals of a nostalgic story. At most I would have liked to search for why the numbering of the trolleybuses started with 51 in Prague. 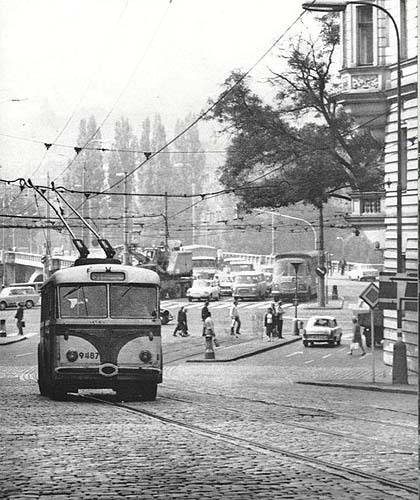 Is there some obscure story behind it, such as behind the numbering of the trolleybuses starting with 70 in Budapest? 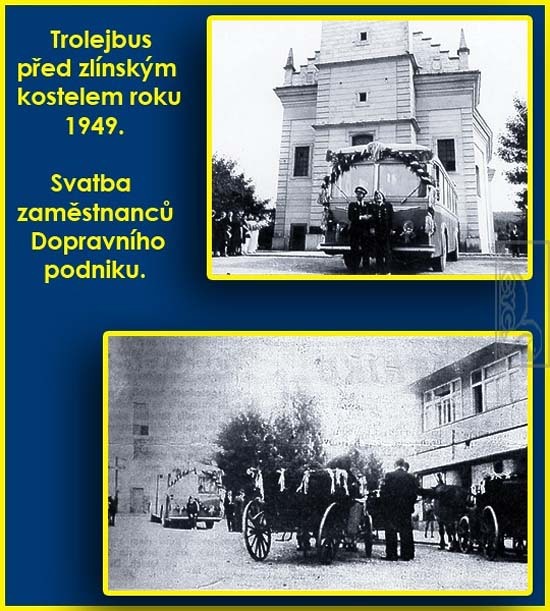 I could not discover it – hopefully our Czech readers would help –, but I clearly saw that none of the two pictures are a terminal, but only a stop in the convoluted history of the Czech trolley, so richly documented by its fans on the net that I rest satisfied with a couple of pictures and references before getting off this vehicle which in have come to like so much in the meantime. The trolleybus stopped exactly on the day of the outbreak of the war, when Švejk was still sitting in the Kalích, so he could not take it when joined up the 91th Infantry Regiment in České Budějovice. However, if he managed to return home “after the war at six o’clock”, then he might have had this delight, as in Prague they launched in 1936 a trolleybus very similar to that of Budějovice. 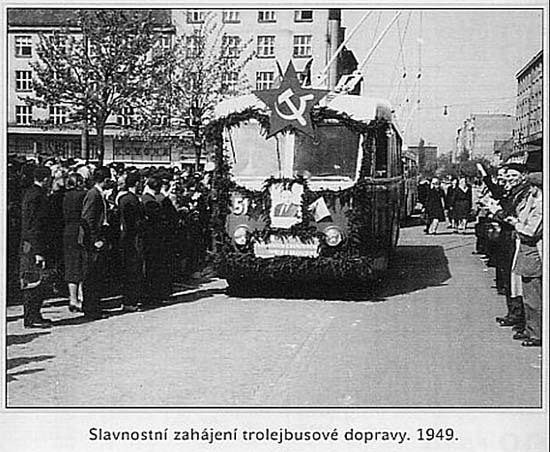 During WWII the trolleybus service ceased, and it only started again in 1949 all over the country, just as elsewhere in the socialist countries, probably in terms of a central Soviet plan. From the several vintage photos let us see here only the start of the first line in Brno, numbered 21, from Přemyslovo náměstí on 30 July 1949. 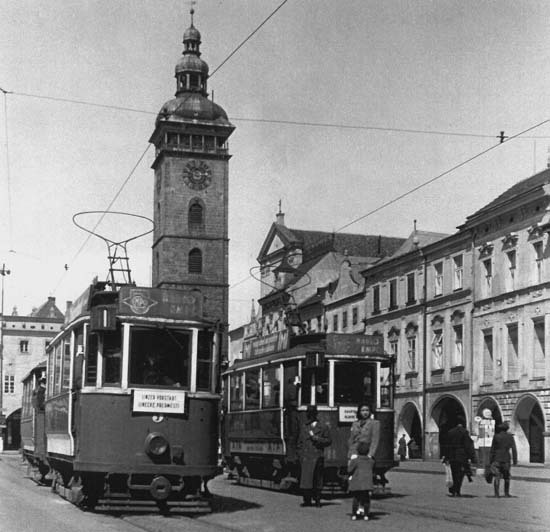 In the next two decades the trolley enmeshed almost all cities of Bohemia, and its modern fans keep in evidence their lines and their history stopping in the early 1970s but starting up in 1991 again in Prague, Teplice, Pardubice, Zlín and elsewhere, as that of the narrow gauge trains in Spain or Hungary. 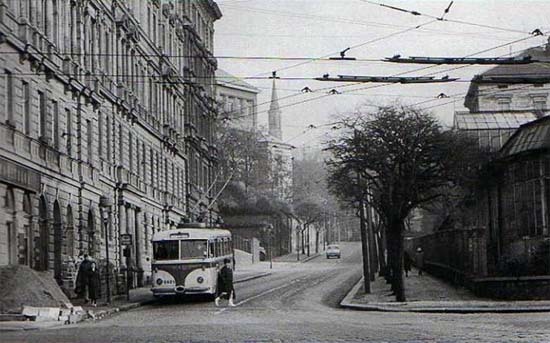 In Zlín they even had decker trolley buses, and it was there that the young chauffeur-conductor couple drove to the church on a flower-covered trolley bus in 1949. If you want to travel about this story, take a ride on one of these websites. the last one, a random one. a crash, a crash in the night. 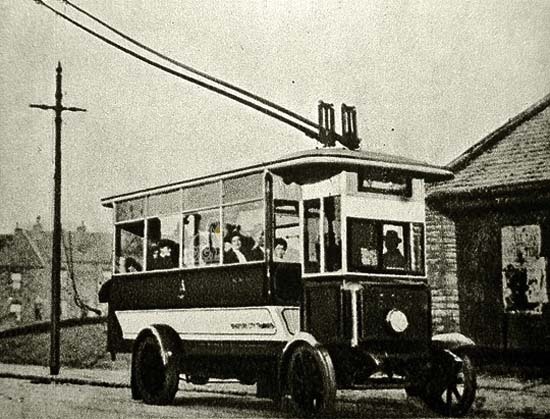 Last trolley, open your doors to me! will come to my help. a young starling, calms down, calms down. I stuck my head into U Kalicha when I visited Prague, but it was horrible, a tourist ripoff joint coasting on their Schweik fame. Fortunately there are many, many wonderful beerhalls in that great city that preserve the old atmosphere and the great beer, even if they didn't have the luck to be mentioned in the novel! In the 80s it was one of the very homely pubs. 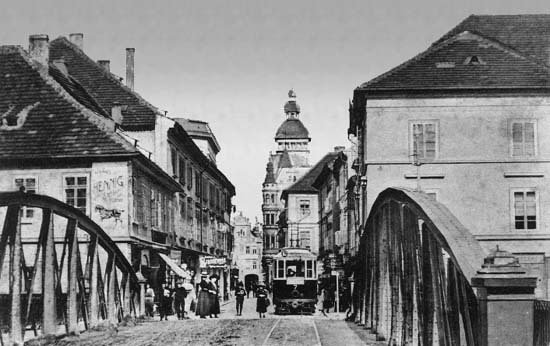 All of them – including U Dvou Koček, U Fleků, or U Zlatého Tygra, Hrabal’s headquarters – turned posh and touristic, together with the complete Old Town of Prague. You have to go to Libeň or Smíchov to feel something from that air. and that air was already dirrefent from the one you could find in Povídky Malostranské by Jan Neruda. I also fondly remember U Fleků from the 80s. Haven't been back to Prague since 1997, so I was a bit sad to learn how much everything has changed. 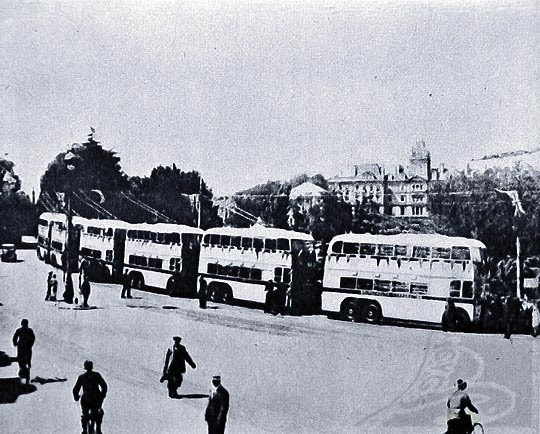 Regarding numbering of trolley bus lines: these tended to be viewed as something between trams and normal buses, so many cities started their number series at a point above the likely future maximum of tram lines. 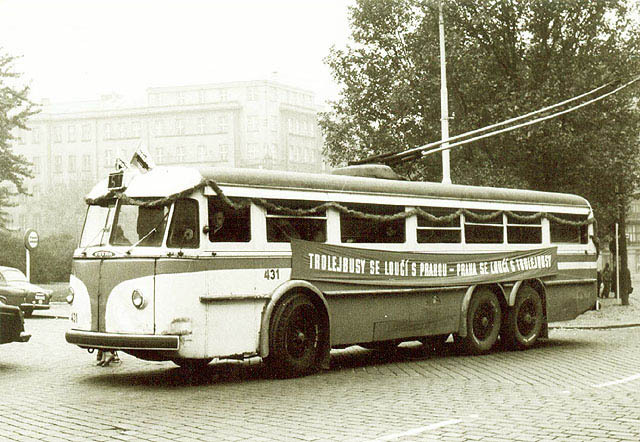 In Stockholm – where we had a few trolley bus lines until 1964 – the first of them was numbered 31. The Prague trolleybus survives in Crimea, where the intercity trolley lines between Simferopol and the coast resorts continue to use Škoda models. 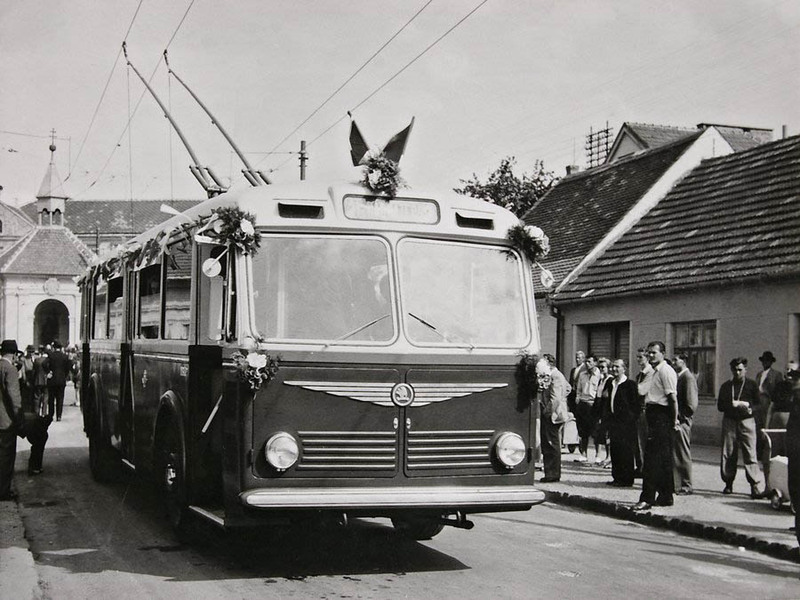 (One recent addition is a customized Zlata Praha trolleybus, complete with a bar serving Czech beers :) ). BTW Okudzhava's song title is often misunderstood as "the last chance", as some sort of an anguish about something which is never more. But of course his "Last Trolleybus" is just last for this night, and it will be there again tomorrow night, and it's about hope and healing rather than about loss. Wow, that’s a great chance! This summer I’d like to make a Crimean tour, so I will certainly test it. I will add this information to the Hungarian version, too. As to the title, it is certainly so. The last three strophes stress this so much that I wonder who might misunderstand it. Per Sandstrom: Yes, this might be the real solution. 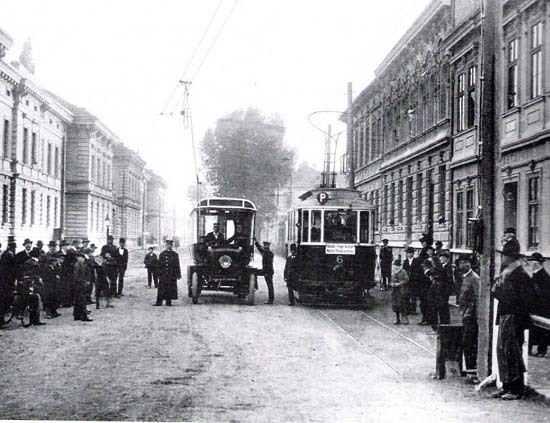 In most cities where I observed this around the world, numbering usually started from 1 (tram no. 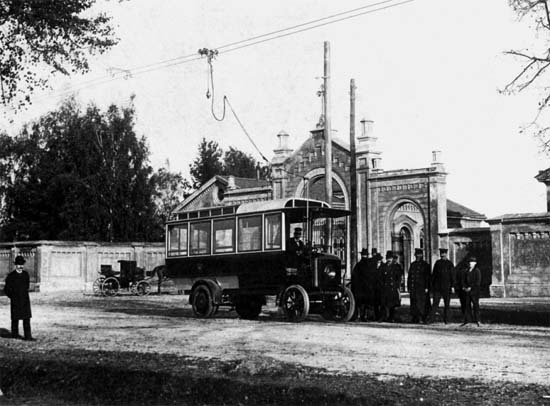 1, bus no. 1), and the only exception, Budapest (where the trolley started with 70) had a political reason, so I did not think about this more reasonable and practical explication. 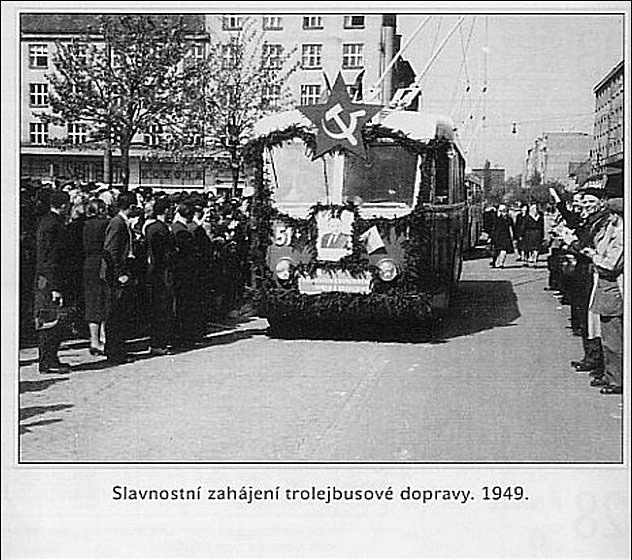 Some one has picture or notice od a italian trolleybus Alfa Romeo in trial run in prague in 1950 and expose t the annual Fair?